With nearly 1 billion passengers taking to European skies in 2016 and the numbers still increasing, the growth in European aviation has been staggering. The effect is that even as many other industries are reducing greenhouse gas emissions through efficiency and new technology, aviation's are on the increase. One person flying from London to New York and back generates roughly the same level of emissions as one year's home heating for the average European. At the recent Transport Research Arena conference in Vienna, Austria, a high-level event covering all modes of European transport, Professor Hans Joachim Schellnhuber, director of the Potsdam Institute for Climate Impact Research in Germany, said avoiding air travel completely was the best option for protecting the environment. But as Sergio Barbarino, chairman of the Alliance for Logistics Innovation through Collaboration in Europe (ALICE) responded, that's an unlikely scenario. "We can't just tell people they can't take their holidays in the Canary Islands anymore," he said. Air travel may be here to stay, but there's no doubt that engineers need to find new ways to make it cleaner and greener. 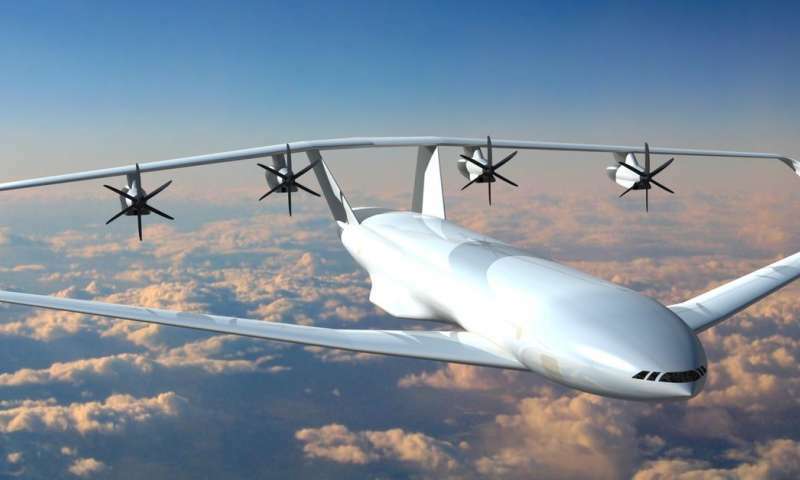 One idea is to radically redesign an aircraft's wing so that it requires significantly less operational fuel, an approach that's currently under development by a project called PARSIFAL. In the late 1990s, Professor Aldo Frediani of the University of Pisa, Italy, and coordinator of the PARSIFAL project, used mathematics to prove that Prandtl's wing theory was plausible. Prof. Frediani and his team began to work on the design of a new closed-wing airplane based on Prandtl's original concept. "The theoretical results can be used to define a new configuration, our configuration," he said. "These aircraft will be much more convenient from the point of view of fuel consumption, noise pollution and emissions," said Prof. Frediani. "This solution could completely change the air transport of the future," said Prof. Frediani. "Thin surfaces or rods tend to deform very easily throughout the manufacturing process," she explained. "You can stiffen them by applying a certain surface structure. The honeycomb structure is one of those bio-inspired structures that can be utilised to stiffen the wall without adding too much weight." "The stalk is hollow inside and it has a double wall system," said Gralow. "It needs to resist wind forces in nature, but struts in the technical world also have to resist bending. By applying the double-walled system to the struts, we can make them more lightweight, but at the same time just as stiff as they need to be." To make these intricate, highly-detailed, lightweight parts, the team uses 3-D printers with laser beam technology. Although ideal for small precision work, the researchers say that printing an entire aircraft in this way is still a long way off. "For now, the goal is really to focus on smaller parts because the build spaces of the current printers are restricted. The biggest commercial printers are about 40—50 centimetres in width, so that sets the maximum size limit for current 3-D-printed metal parts," said Gralow. Absolutely nothing wrong with copying God's creations. After all we are made in His image! However, it would be very appropriate to give Him all the credit for His ingenious designs! Great, @FreddyJoe. Tell us how jebus designed aircraft. Maybe you can show us some aeronautical engineering in the Babble. Absolutely nothing wrong with copying God's creations. Yep...because there are so many closed wing designs in nature...oh, wait...no, there aren't. What is needed to reduce weight and drag is an all-wing aircraft having boundary-layer control. The HP 113 and 117 design of the mid 1950's were rejected by the British government, but their basic claims for efficiency are still true. This company, Handley Page Ltd., was producing a double-skinned (corrugated web) wing surfaces on their Victor HP80 heavy bomber design, which is equivalent to the honey-comb noted above, but cheaper to make since it was automatically spot-welded. These ideas should be re-examined and acted upon.